Are you flying in places where controllers are not used to announcing their plans by booking? No problem. vroute (both premium and classic freeware) have now a feature we call "statistical ATC forecasting". It's not as complicated as it sounds - we monitor for you the time of day and day of week when certain ATC positions are occupied and show the probability in ATC forecast view. 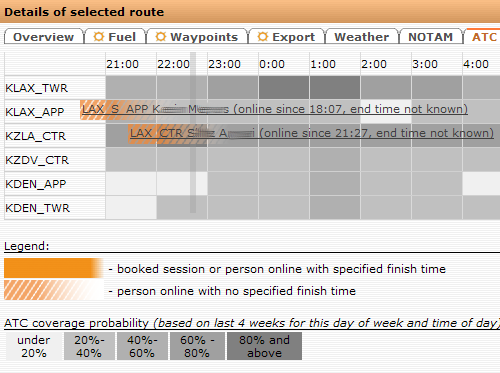 For example looking at the screen above one can see that LAX_TWR is very often online (80%+ probability) between midnight and 2AM on Fridays in user's local time zone (no need to check time in LA or convert from UTC). It's not necessary to check even announcements or study VACC websites - vroute automatically monitors ATC availability to reflect latest trends in the forecast. As part of our commitment to extending the freeware products as well, this feature is available in both premium and classic (freeware) version of vroute.